A Conservative election candidate has been caught out misleading disabled constituents about the closure of the Independent Living Fund (ILF). A transcript of an election hustings event in Merton, south-west London, has been published which shows that the Conservative candidate Paul Holmes misled voters when asked about the ILF. Holmes told the audience on 9 March that he knew there was “a lot of concern” about the ILF, but that “people that were on the ILF from quite a while ago will continue to receive that money, but for new applicants it has closed, and it’s going down to local authorities”. This was inaccurate because the fund will close to all ILF-users at the end of June, with the UK government passing the non-ring-fenced funding to English local authorities and the Welsh and Scottish government. The hustings was organised by Merton Centre for Independent Living (CIL), Merton Seniors Forum, Merton Mencap and Age UK Merton. Holmes should have been aware of government ILF policy because he has been working in the Westminster office of Tory Wimbledon MP Stephen Hammond, who has been briefed several times on the issue by Merton CIL. Holmes has so far not responded to a request for a comment from Disability News Service. 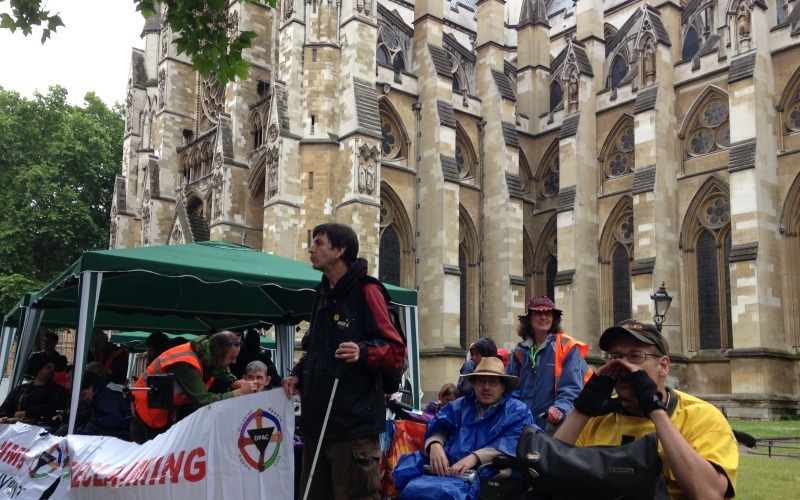 The decision to close ILF has been one of the most controversial of the last five years among disabled people and their organisations, and has been the subject of a series of legal actions, protests (pictured) and direct actions over the last four years. The government has continued to argue that the care and support needs of ILF-users are better met within a single care and support system, run by local authorities. But many campaigners believe that closing ILF – a government-resourced trust which helps about 16,500 people with the highest support needs to live independently – will threaten disabled people’s right to live with dignity, and could force many of them into residential care or make it impossible for them to work or take part in everyday activities. The Scottish government announced last year that it would set up its own ILF, for both existing and new users, while the Welsh government has opted to transfer the government funding and responsibility to local authorities, but with conditions attached on how it should be spent, protecting the budgets of existing ILF-users for at least the first nine months. ILF-users in Merton do not yet know whether the government funds will be ring-fenced for their use, according to the latest research by Disability Rights UK. Of 96 English local authorities that responded to the charity’s latest Freedom of Information Act requests (out of a total of 152 councils), only 24 said they would ring-fence the government funding. And some of these 24 are only ring-fencing the money because they have not yet carried out assessments of existing ILF-users. Merton is one of 22 local authorities that have yet to decide how the ILF funds transferred by the government will be used. Meanwhile, a prominent ILF-user, Mary Laver, marked the 61st birthday of Conservative work and pensions secretary Iain Duncan Smith, by riding her powered wheelchair from the House of Commons to the MP’s constituency in Chingford, east London. Laver, an ILF-user for 25 years and herself a member of the Conservative party, yesterday (9 April) travelled the 14 miles to deliver a “very special birthday card” to Duncan Smith. She says Duncan Smith is the man who is “going to imprison me in my own home for the rest of my life without a parole or right to appeal” by closing ILF, which has helped her live an independent life for the last 26 years.